Hello Everyone & Happy Friday! We are expecting temps in the 50's over the weekend and for this time of year..sounds amazing! We happen to have our youngest Granddaughter staying with us for 4 days while her parents are on a mini vacation. So we have our hands full.... but enjoying little Ailey bug like crazy! I started with a card base using Jaded Blossoms Scallop Rectangle Dies 1. I then followed with a background panel using TH distressed inks. The little critter is Die Versions Whispers Bug Friends Die and the balloons are Impression Obsession Heart Balloon Die. The pattern papers are Echo Parks Bundle of Joy collection. Along the bottom is the Penny Black Edger Die. 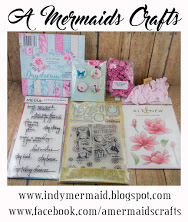 The Memory Box Honeycomb Remnant Die was used on the top right and the Happy Birthday are Tutti Designs Word Set Dies. I finished with a little twine bow and some fun little pearl dots. These cards are just as cute as cute can be! Love the colors of the balloons and that bug is adorable! Thanks for playing along with us at DL.ART Challenges! They're so sweet and beautiful, Sherrie!! I love the background colors!! The bug is absolutely adorable!! I love the dies you used and the heart balloons!! What a fabulous card!! 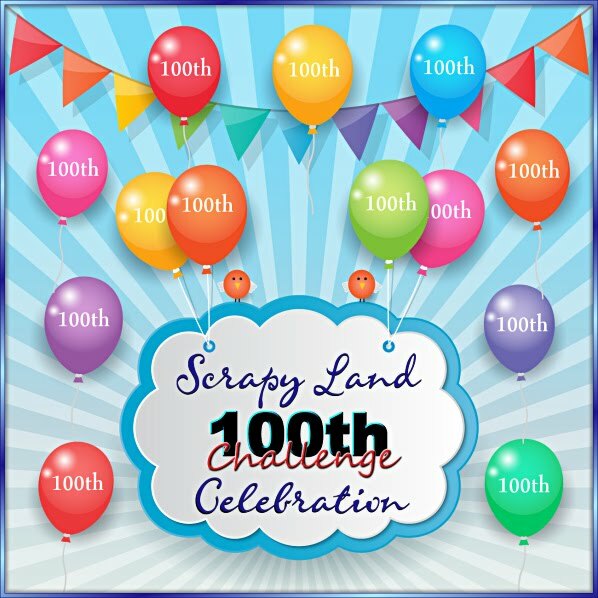 Thank you so much for playing along at Scrapy Land and DL.ART!! Your cute little bugs will surely bring a birthday smile....love the backgrounds, too! Thank you for sharing at Jo's Scrap Shack. 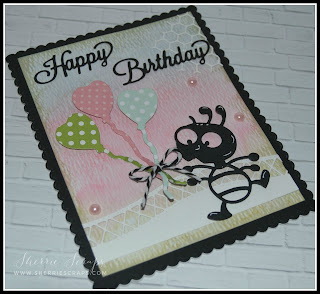 Sherrie,I love your card the cricut with the fun heart balloons is just too cute I love it. I think he is looking cute! Sooooooooo cute! LOVING the little bug!!!!!!!!!!!! 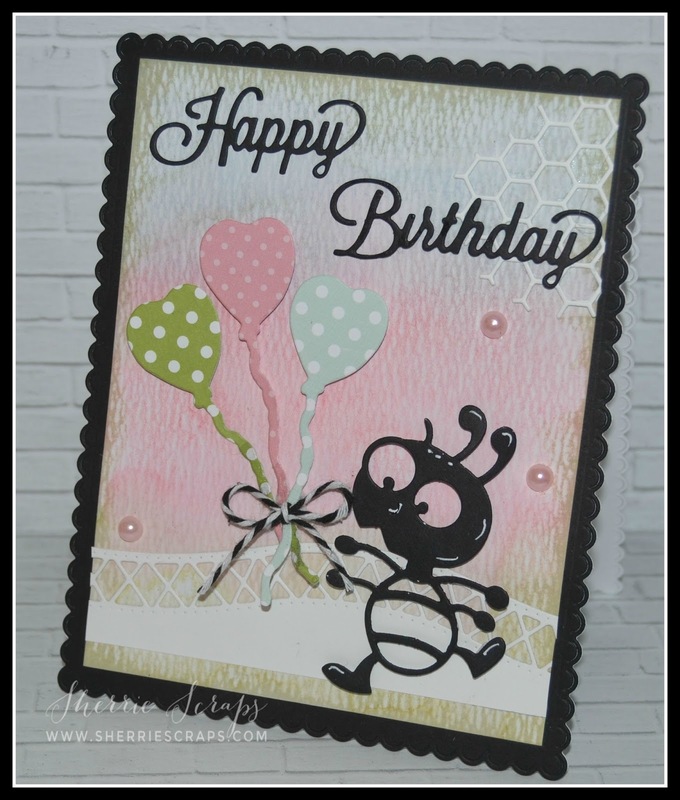 Thanks for joining us for our Birthday Card challenge at Cut it Up! I cannot stop smiling over that cute critter! !Seriously TOO cute! !I love the pretty background and super cute balloons! Super cute card! I love that little bug die so fun! Glad you are getting some nice weather, we are also and I am so ready for it. I love winter and snow but we have had an abundance of it and I am ready for some heat! Very cute and fun card!! Thank you for joining us at Jo's Scrap Shack. funny thing about cards you don't really like is we are our own worst critics and who ever we give the cards to always love them. Enjoy your time with you little Ailey. It's funny how we each feel about our own cards! Sometimes we're happy with them and sometimes were like UGH! LOL I actually like these cards! 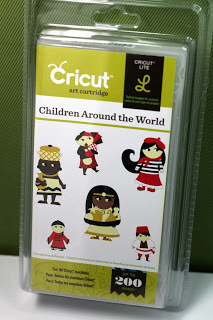 I think they are adorable and I love all the different dies you used - they look awesome! I hope you enjoy that quality time with your sweet grandbaby! I know she'll wear you down but we both know, it'll be so much fun having her there with you! Enjoy the warmer temps too! You never know when old man winter might pop back in on ya! :) HUGS! Oh how cute Sherrie! That little creature is adorable and I love the fun balloons! What a super cute card, Sherrie!! Love the adorable little bug!!! Have a great day. 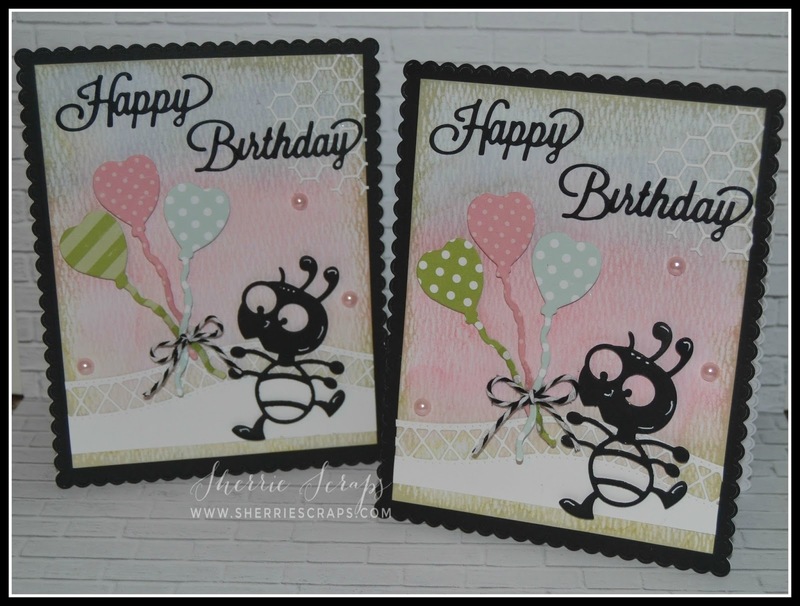 Very cute birthday cards!love the background and bug! These are so super adorable Sherrie!!!! 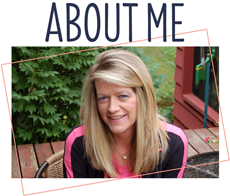 These are adorable, Sherrie! I really like that sweet little bug with his birthday balloons! And your background is super cool. That mix of inking and layered dies looks amazing! Sounds like you've had your hands full with your sweet grandbaby! Enjoy! Adorable set of cards! The little die you used is absolutely adorable! Loving the birthday theme with the festive background and balloons! Awesome cards! These cards are stinkin' cute! Cute cards. Love the heart balloons. Thanks so much for joining us at Seize the Birthday. These are SO cute!! 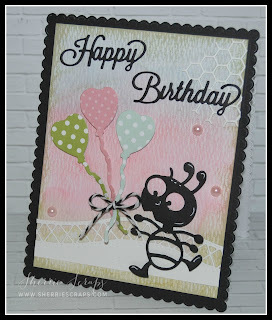 The distressed ink backgrounds look fabulous and that little critter is adorable!! Hi Sherrie. These are just adorable! I love the papers you used for the balloons, and how cute is that little bug with his balloon bouquet!! HA!! Wonderful card, so fun and cheery for a birthday. I do hope your parents are doing well, sending them healing hugs. Don't forget to take a minute or two for yourself my friend, you need to stay healthy and strong!! Sherrie these are so cute!!! I love that little bee!!! The balloon bouquet is just so cute with the different colors and the twine... and I love that beautiful inked background! I hope you had a wonderful time with your granddaughter! Thank you for playing in Jo's Scrap Shack's FFC this week! Hope you have a great day! Oh, I think they are super cute! I love your inked up backgrounds and that fun little bug! I know you must have had a wonderful time with your granddaughter. They sure do keep us on our toes, but aren't they wonderful?! ?